Key evidence linking Dr Conrad Murray with Michael Jackson’s death was destroyed just three hours before the singer was reported dead, police believe. MICHAEL Jackson’s secret stash of potentially deadly drugs was only found by detectives after the dead star’s doctor “blurted out” its hiding place. 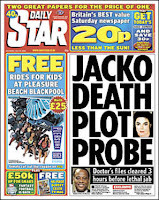 Any story about Jackson's death - particularly those based on anonymous stories - needs to be taken with a large pinch of salt - espcially when it's in the Star. The same article, incidentally, also 'exclusively' claims Jackson overdosed three times in his last 18 months - a far bigger story, if true, than the one they actually lead on. So it's very likely not true either. Is Media Monkey reading this? A 'crimewave' is when there is less crime? Jacko's killers named! Except they aren't.